With his win in Sunday’s Formula One Indian Grand Prix, Red Bull driver Sebastian Vettel joined the rarified ranks of four-time World Drivers’ Championship winners. With at least a decade left in his career, the 26-year-old German could easily surpass the seven WDCs of the legendary Michael Schumacher. Only three other drivers have won four or more driver titles, and only two others have won four or more in a row. Schumacher won five in a row (2000–2004) and Juan Manuel Fangio, four of his five consecutively. The only other four-time winner, Alain Prost, needed eight years to win four. Schumacher competed in 307 races and won his fourth consecutive title at age 34; Fangio won his fourth in a row at age 46 after 51 starts. Vettel, at 26, has four in a row in 117 starts. Schumacher raced in F1 until he was 43; Fangio was 46 when he won his last title. 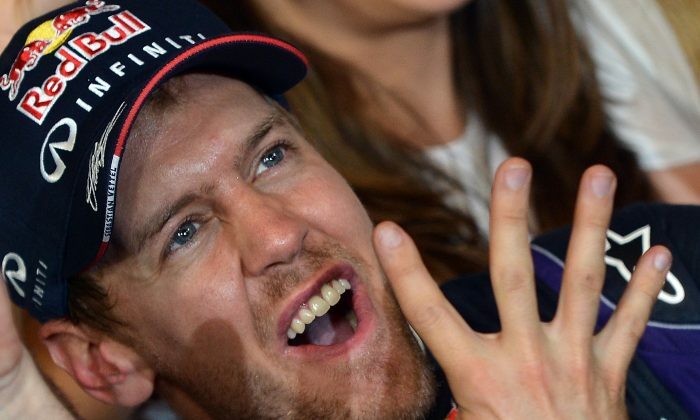 If Vettel drives merely ten more years, he could surpass both. If he continues to win at his current pace, he could own all the records and retire at age 30. Along with winning the drivers’ championships, Vettel has also brought Red Bull it’s fourth consecutive Constructors’ Championship—not bad for a team that has only existed for nine years. The win at India was also Vettel’s sixth straight win—and with three races left on the schedule, he could easily end up with a record-setting nine. All this in only his sixth full season in F1. Some could argue that Vettel has seen so much success because he drives what is unquestionably the best car on the grid, the Red Bull RB9. Adrian Newey, who has designed the RB9 and all of Vettel’s championship-winning cars, answered those critics. Vettel showed that he understood what his win means in the greater realm of racing history. “I want to say a big thank you to the team, to all the people that were behind us. For sure it was not an easy season, even if people from the outside get the idea that we had it in our hands for quite a while, the last couple of races. But I think it was a difficult one all in all. The Indian Grand Prix wasn’t the usual Vettel win—the young German didn’t gap the field and lead every lap easily—at least not right away. An interesting compound selection offered by tire supplier Pirelli left teams guessing on strategy. Pirelli supplied the Medium and Soft tires, which on India’s Buddh high-speed circuit were good for about 35 and 15 laps, but the Softs were only good for about five laps on full tanks at the start of the race. Most teams used Softs in qualifying, meaning they had to start on Softs. Red Bull split their strategy: Vettel took the pole on Softs while Mark Webber in the second Red Bull qualified fourth on Mediums. Vettel pitted on lap two for Mediums. As the rest of the field pitted, he cycled back to the front, retaking the lead on lap 29, giving it up for a lap to pit, retaking it on lap 33and never again surrendering it. Webber meanwhile took the lead on lap nine as everyone of Softs pitted and stayed out until lap 29, when he handed off to his team mate. Webber only did four fast laps on his Softs, but Vettel pitted first on lap 32. Webber led a lap and came in on lap 33, came out in second, and likely would have finished there had his alternator not stopped working. The Red Bull pits were scared—alternator problems had cost them races in the past, and since both cars were identical, Vettel’s could have been soon to fail, too. Vettel was ordered to turn off KERS, his electric drink bottle pump, and everything else that used electricity and wasn’t absolutely needed to keep the car running. Apparently fate didn’t dare interfere with Red Bull’s dominance. Vettel’s car ran faultlessly and he finished the race nearly 30 seconds ahead of Mercedes’ Nico Rosberg in second. Third went to Lotus driver Romain Grosjean, who started 17th after his crew messed up qualifying. Fernando Alonso, the only driver mathematically able to win at the start of the race, had nothing but bad luck. The Ferrari driver started eighth after a dismal qualifying session, and that was as good as his day got. Mark Webber, trying hard to make up places on the start, slammed the right-hand curb and bounced across the road. Webber’s Red Bull fishtailed, hitting the Lotus of Kimi Räikkönen and then ricocheted into Alonso’s front wing. Alonso brought his Ferrari in for a new wing, but the car was still not right and despite the beset efforts of the two-time champion, he finished 11th. The titles have been awarded, but the rest of the teams will still have to race hard: for points for the drivers, which can help their future hireability, and for constructor points, which determine how much money the teams earn each season. The next Formula One race will be the Abu Dhabi Grand Prix, Sunday Nov. 3. The race starts at 8 a.m. Eastern time. Tickets and travel packages are available through the formula1.com website.